Having spent $24 million building machines that extract oil out of water, Kevin Costner hopes to help clean up the Gulf Coast. TIME looks at some of the most philanthropic celebrities and their causes. 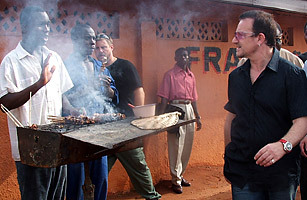 U2 lead singer Bono has tried to call attention to issues of poverty, hunger, health and security in Africa for many years. His organization DATA (debt, AIDS, trade Africa) was formed in 2002 as an anti-poverty advocacy group. His work  including cajoling leaders of the world's richest countries into forgiving $40 billion in debt owed by the poorest  made him TIME's 2005 Person of the Year (along with Bill and Melinda Gates) and shone a light on his immense dedication to making critical advances in the underdeveloped world. Six years later he merged it with ONE, a 2-million strong grassroots campaign and advocacy organization. The Irish musician, who often participates in high-level discussions about global poverty including the World Economic Forum, has reportedly been nominated three times for the Nobel Peace Prize. Read "Can Bono Save the World?"